Bly Tract in Culpeper Co. The American Battlefield Trust—formerly the Civil War Trust—has donated to the Virginia Board of Historic Resources (VBHR) a preservation easement over the Bly Tract, comprising more than 29 acres of open pasture in Culpeper County that is directly connected with fighting during the Battle of Brandy Station (1863) and located within the boundary of the Rappahannock I Battlefield (1862), also known as the Battle of Waterloo Bridge, White Sulphur Springs or Freeman’s Ford. The American Battlefield Trust (ABT) purchased the tract using grant funds awarded by the National Park Service’s American Battlefield Protection Program. Acreage purchased with those funds must be placed under a protective easement, among other requirements. The eased acreage will be monitored by staff of the Department of Historic Resources, which is tasked with managing preservation easements held by the VBHR. Fought June 9, 1863, the Battle of Brandy Station was the largest cavalry engagement of the Civil War and the opening gambit in Confederate Gen. Robert E. Lee’s campaign to invade the north, which culminated in the Battle of Gettysburg in Pennsylvania in early July of 1863. Brandy Station pitted the cavalry of Confederate Maj. Gen. J.E.B. Stuart against that of Union Maj. Gen. Alfred Pleasonton. During the battle, when Confederates moved to block the possible advance of Union forces along the Orange and Alexandria Railroad (parallel roughly to present-day U.S. 15), regimental commander Col. John Logan Black led his men forward across the Bly Tract, after which Confederate cavalry charged over the property, attacking a brigade of the Union 3rd Cavalry Division commanded by Brig. Gen. Judson Kilpatrick. During the First Battle of Rappahannock (Rappahannock I), fought between August 22 and 25, 1862, the Bly Tract witnessed troop and cavalry movements in the vicinity before, during, and after the four days of fighting. Unimproved and serving mostly as pasture, the Bly Tract contains important archaeological and other historic resources related to the battles. The tract is visible from Rte. 685 (Fleetwood Heights Road) and US 15/29, placing it within the 175-mile corridor known as the Journey Through Hallowed Ground National Heritage Area, which falls along US 15 between Thomas Jefferson’s Monticello in Albemarle County and Gettysburg, Pennsylvania. 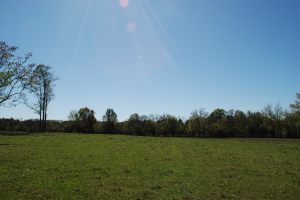 Preservation of the Bly Tract’s 29.557 acres adds to the 4,124 acres, the majority of it battlefield lands, already held under easement by the VBHR in Culpeper County. The eased properties include other tracts associated with Civil War battles, as well as historic buildings, structures, and landscapes. The ABT plans to maintain the Bly Tract as pasture and interpret it as a Civil War battlefield for the benefit of historians, researchers, and the general public. Civil War tourism is important to Virginia’s economy. A 2015 economic impact study requested by the Virginia Sesquicentennial of the American Civil War Commission showed that the 150th anniversary (2011 to 2015) of the war brought more than 3.7 million people and $290 million to Virginia, where roughly a third of all the Civil War’s major battles were fought.